As the name says it all, it is a lovely masterpiece, which has been designed to cater the need of fashionable men. This designer Cafe Racer Outfit has a supple texture derived from premium cowhide leather. The uniqueness lies in the clay or camel brown shade which has wrecked and rugged look. In addition, with a perfect would neck with close button, the cafe racer attire provide feasibility in swapping the styles. There are simplest two chest pockets, while two are present on the waist too. The beautiful and super comfortable motorcycle upper features a lovely zip fastening running down the center. The overall cafe racer outfit’s vintage look has the contemporary blend as it fits the body well and enhances the personality. Cafe racer outfit can be worn for both casual and formal events with black boots. "I ordered this beauty for a friend of mine and since when I came across this Karl Ruprecht Kroenen coat I was amazed the finishing is something that a"
"This is what I am looking for. 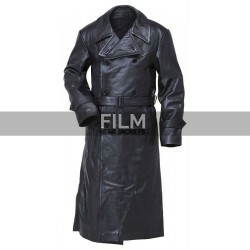 An Excellent trench coat made from high quality of genuine leather and stitched with perfection. Thanks to filmstarsj"